Here’s a bright spot for your Monday. It is a picture of one of our favorite fish, the red head solar fairy wrasse (Cirrhilabrus solorensis). This particular individual is a male of the species, which is far more colorful than its female counterpart. Where the female has a red/purple head and a dull copper colored body, the male is far more vibrant. He sports a neon orange face, deep blue body, and a beautiful white streak that runs from head to tail along its ventral side. 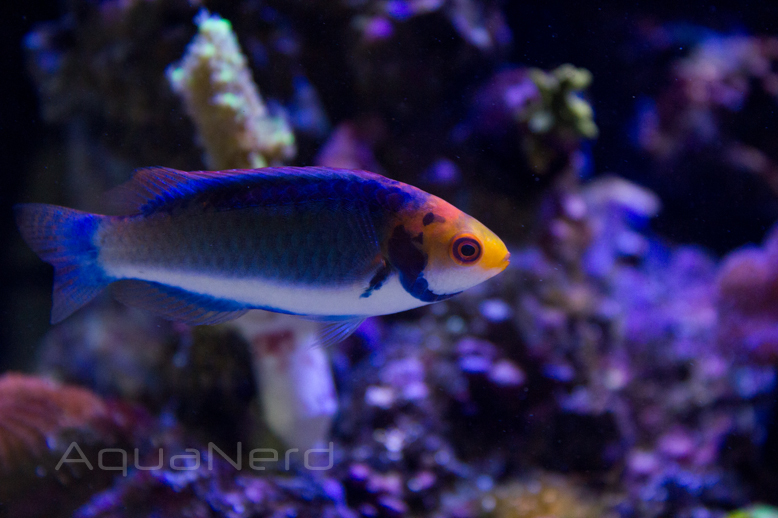 This fish, like most fairy wrasses, is a great community reef dweller. It usually cruises around showing off its colors to tank mates, and if you have other wrasses in the tank, the displays can be quite breathtaking.